This afternoon I headed out to do a bit of shopping in preparation for Thanksgiving. I only had a couple of things to pick up so decided to bundle up and walk the mile or so to the store. I was at Safeway down on Broadway near the Dollar Tree with a C-note in my pocket. After I paid, I saw a man standing in front of the lottery ticket dispenser. He was rifling through his wallet. “You ever have any luck?” I asked. “Yeah, every once in a while,” he said. “One time I hit one for forty eight thousand! Forty eight thousand five hundred and twenty.” “Wow! What’d you do with the money?” I asked him. “Oh, I have five children and 100 grandchildren,” he said, rather bitterly. “That’s where most of that went.” I wished him luck and headed out. It had started to rain by the time I left the store. I thought of Frank from Day 27 and listened for his harmonica as I crossed the walkway. I would have loved to see him but hoped he was at home, warm and dry, rather than outside selling his newspapers. I was dressed for the weather but still felt the sting of the windblown drizzle on my cheeks. The sky was white as chalk. I didn’t need anything from the Dollar Store, but couldn’t resist the warm invitation. His name tag said “Tyrone”. I stepped inside the store and teased him a little. “I didn’t really want to come in. but I couldn’t resist you!” He laughed and said that Dollar Tree was paying him to be a greeter. “Can you believe it?! A greeter! 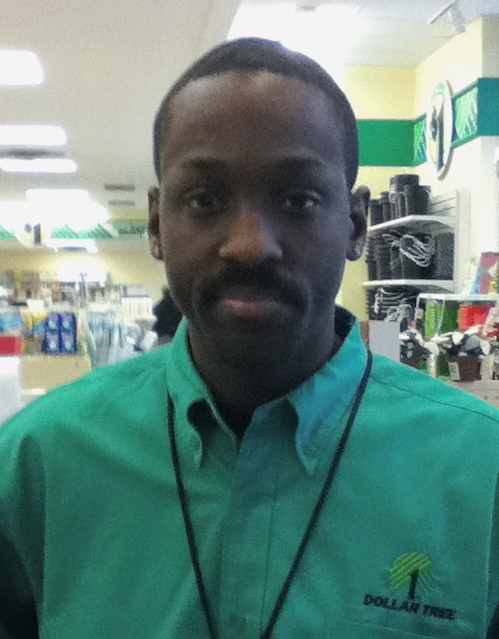 At Dollar Tree!” He said he loved to surprise people with friendliness and respect. Especially if they have problems, and if they just need to talk. We settled into a comfortable exchange and he told me had been in Portland for 18 months. He had been running with the wrong crowd in Pasadena and one day realized he had to turn things around. He left his old life behind and arrived in downtown Portland on the Greyhound, penniless. Everywhere he turned, people reached out to help him. He got a shelter bed, then a job, then another job, then an apartment. I asked Tyrone if he would get in trouble if I gave him something. “Yeah, maybe. I don’t know. I think they worry more about money, like they don’t want us to be taking no tips. Really? Tips? Ha!” His good-humored laugh took any sting out of the words. I told him I wanted to give him something, but it wasn’t a tip, it was just a gift for the holidays. I showed him some pictures on my iPod and he asked if I could email him a photo of the two of us. He called a woman over and put his arm around me as she held the camera up to her eye. He wrote down his email address and I said I would send him the picture. I patted at my hair, laughing about a chunk that I could see sticking up in the photo. “It’s down now,” he said, smiling. We shook hands. So cool. I have become more assertive but I do it with 20s. Tyrone sounds like a kindred spirit, filled with love and respect for others, and ready for kindness to take him by the hand. Lovely story, Jill. I loved it, as usual. It seems you are now drawn to just the right people! If you were unsure during your Month of Hundreds, you’ve now developed an amazing ability to connect with the people who not only love what you’re doing, but make you feel fabulous about gifting them with the C-note. As we move into the season of holidays, it is especially good to read your posts. I love the unique perspective you have put on them for me. If you were here, I’d give you a big hug! You did again and that makes me so happy to see the people you find to give to. Too bad there isn’t more like him around. You good great in your picture with him,so happy. I love reading what you write. Yeah, I love hearing the stories and learning about the connections you make on this amazing journey. But really, most of all, I just like to “hear” you. I love your written voice. Thank you for inviting us to share the voice and the stories. Another WONDERFUL winner, another GREAT choice of recipient! And yes, you write it all so well! I have spent a good part of the day writing and calling friends who have suffered from illness or bad news, to cheer them up, to do my good deeds for the day, to tell them I hold them in my heart and in my thoughts. It almost depressed me, because there were so many who needed cheering. Oh how I love your stories. Each one is worth a million dollars. Jill, you are changing a lot of people, me, included. Tyrone is a great young man, a natural born greeter. You found another gem, Jill. Jill, your generosity goes around and around, bringing blessings not only to those who receive the C-note, but to all of us who read your lovely words, so beautifully expressed, and are inspired to go out and do good for others by your example. I read it in all the great comments here, how you have touched so many hearts, and this has become a never-ending blessing to all who read your words, who take them to heart, especially in this Season of Love and Wonder. tyrone is one of my heros! he’s always that great of a guy! meeting him also had a huge impact on my life! I am so glad I met Tyrone! I always think of him now, and one of these I’m going to go say hi to him at work. He has a great future ahead. Thanks for writing! I happen to know this man, where he is coming from and what he has now done. Your generosity could not have been received by a more worthy candidate. Tim- How wonderful to hear that from you. Thanks so much for writing. I am one of Tyrone’s friends, with both walk the same road of recovery. He truly is an amazing individual. you have put so much warmth not only into Tyrone’s life, but into the lives of everyone he touches with his amazing presence. from the bottom of my heart I wish you a Merry Christmas and a Happy new year. What a wonderful story. I’m Tyrone’s MOM and he shared this meeting with me and you helped to kept his path forward attainable with your kindness. Thank You. and for You Tyrone a MOM couldn’t be PROUDER. I love you very much.